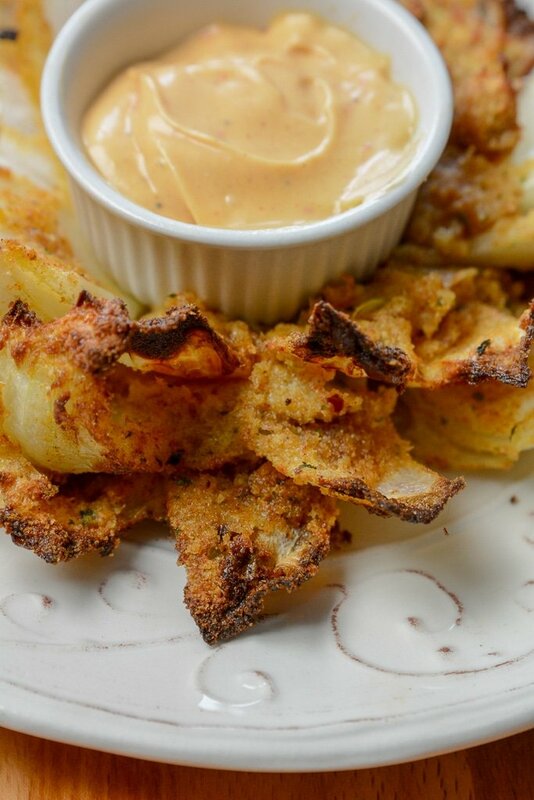 Never have to leave your home again for that restaurant quality blooming onion again! 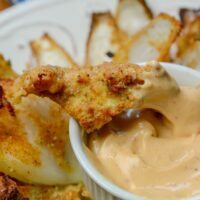 Grab your Ninja Foodi or Air Fryer and make this savory and mouthwatering Air Fryer Blooming Onion. Crunch batter that has a tender and savory onion inside. 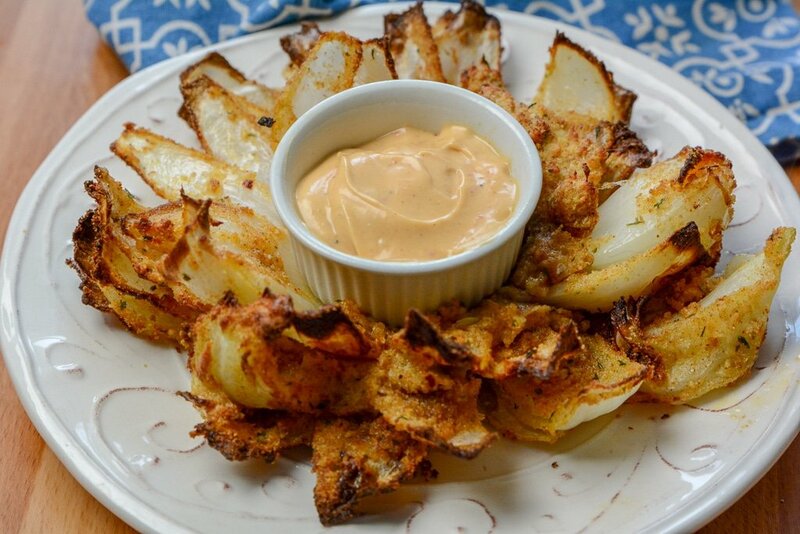 Pair with your dipping sauce and dive into one outstanding appetizer or snack. We all know Outback Steakhouse is famous for their blooming onions. That is the first time I ever tried one, and let me say it was love at first bite. That crispy batter paired to the tender onion was alone outstanding. Then add in the dipping sauce, and I went ahead and died and went to heaven. It is like an onion ring on steroids on the flavor factor. What I love about using my Ninja Foodi is that you get that air fried texture without dropping your blooming onion into a pan of grease. This is a healthier version that doesn’t lack any flavor. The hardest part about this blooming onion recipe is you have to allow the onion to soak for two hours in water so that it blooms. But trust me, the wait is beyond worth it for the result. e as your onion cools it can become soggy. If you do have leftovers that you want to reheat just preheat the oven to around 430 degrees and wrap your pan in foil. Then place the onion on the pan and bake until you see it is heated through and gains back some crunch factor. Check every 4 minutes or so to make sure it doesn’t overbake. If you heat in the microwave, it will give you a soggy texture. So if you all know by now, I got a Ninja Foodi. 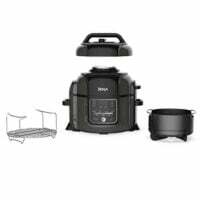 It is a new kitchen device that combines the air fryer and instant pot in one. You can use this device for so many more incredible uses from appetizers like this to main courses. 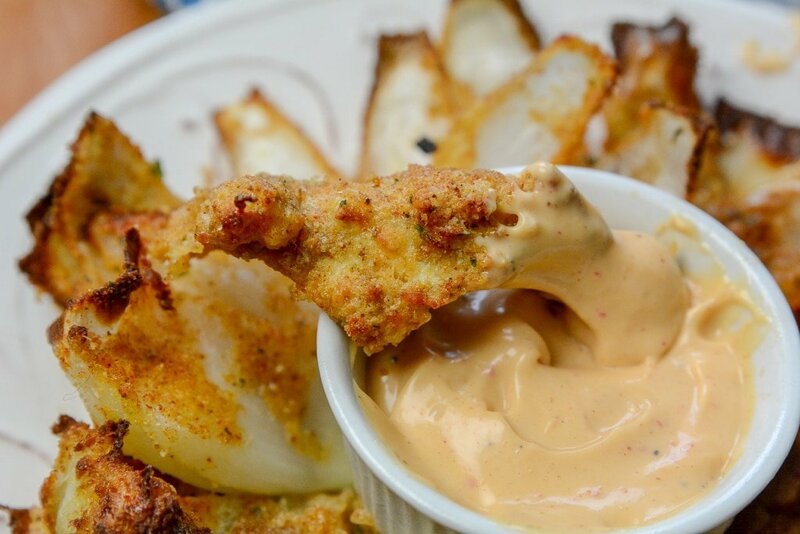 I reach for the air fryer feature because you get that same crispy breading you love without frying your onions. A much healthier version but without losing the flavor. The air fryer is my new favorite way to cook to give your food that crunchy crust that you know in love all by using hot air that circulates. It is incredible! Give my Ninja Foodi Blooming Onions a try today. The big game is coming up, and this would make an incredible appetizer to serve up to guests. Starting 1⁄2 inch from the root, cut downward. Cut 8 slices all the way around. Coat onion with egg mixture make sure you get all petals. Tip over to allow all access to drip off. Sprinkle panko all over the onion getting all of the onion. Place in the basket of your Ninja Foodi or air Fryer. Cook on air crisp 390 degrees for 10 minutes.